Sentenced to life in absentia by the Military Court in 2013. Hassana was granted political asylum in Spain. Hassana Alia was not summoned to the proceedings at the Court of Appeal in Salé. "Being sentenced to life doesn't hurt me", Hassana says, "what really hurts me is that I won't be able to return to see my parents, brothers and sisters". Hassana Alia, born in 1989, is the one that got away. 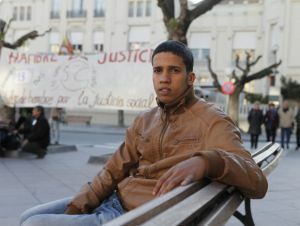 Hassana heard the Military Court's verdict over the radio, in Basque Country, Spain, where he is living today. It doesn't bother him that the Moroccan authorities know of his whereabouts. "I am not going to hide", he says. "I was arrested in 2010 while we were being evicted from the Gdeim Izik camp. The Moroccan police released me twice, because they had no evidence against me. They gave me a visa to leave the country without any difficulty. Now they've condemned me for something they've previously said I didn't do." Hassana now dedicates his life to raising awareness about his friends who are in jail, condemned to tough sentences on the same grounds as he was. He is militant, but his gaze starts to blur when asked if he would like to go back. 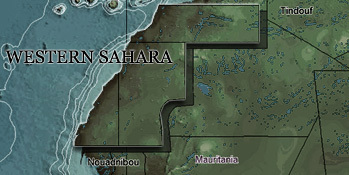 Hassana takes a deep breath, and says "not now. I would love to see my parents, my brothers and sisters, my people, my country, but if I would end up in prison, then there would be nothing left for me to do. From the outside, I can tell the world about what has happened to my friends, and fight for them."